We had a really nice weekend... and I did get lots of relaxing/lazy time in, which is good since I'm feeling a lot slower these days! Friday we did a "last hurrah" dinner... since we don't know when I'll actually go, we figured we'd take advantage of our free Friday and get a nice dinner out. We hit up the Pearl, and had a really nice time... good food, and nice relaxing conversation. Saturday I spent the majority of my day in PJs! :-) Exactly how I wanted it. We headed to my friends Deb & Steve's place around 4. They headed out for dinner and we watched their two-month old twin boys for them. 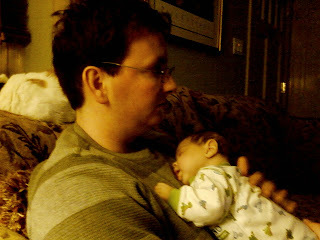 That's where the picture is from... that Trav holding a sleeping Stephen. It was so sweet I had to snap a picture. I didn't get a good one of Dominic, but he's such a cutie too. I wanted to call you yesterday but it got away from me. Tell Travis he has the magic touch Stephen slept 7 1/2 hrs the night you sat, that was the longest he ever slept through the night so far. He has magic arms. Your little girl is in store for such a treat you both are going to make WONDERFUL parents!!!! Thank you again for Sat night it was so great!!!!! It really was neat seeing Trav with the little babies. He was great. Sunday we had more relaxing time in the morning. In the afternoon we ended up doing a lot more then originally planned. Mary & Casey (the ones who already brought us a big bag of baby clothes and the snoogle which saved my sleep!) stopped by to bring me a big bag of maternity clothes to borrow. I can't tell you what a lifesaver this was! I can probably wear a different shirt from now until I give birth! There are a variety too... I'm wearing a light, short-sleeved one today, which is perfect since its 60* today! I'm so grateful for the comfortable clothes, because otherwise, I'm so uncomfortable right now! It wasn't too bad over the weekend when I could lay down on the couch, or prop in all sorts of ways with pillows... but at work so far today has been not great. Anyway, after Mary & Casey (and their two cutie girls) left, we headed over to Willy's house... just for a stop in to see how he is doing. He's doing well. His birthday is Friday (86!!) and he's having a bit of a party on Saturday evening, which we're going to try to stop by. From Willy's, it was on to Ro & Pat's for dinner and hanging out. In between all that, Trav hit up the grocery store and we watched some hockey and football. But for me at least, most of the weekend was just about trying to rest my sore body. I have a prenatal massage scheduled for Friday and I can't even begin in describe how excited I am for that! Tomorrow I have the day off, but there won't be much relaxing going on. I have two meet & greets with possible pediatricians, a doctor appointment, and our last birth class! And, I'll be 36 weeks pregnant. In my 9th month! Well, I have to get back to work... but look for a weekly review on wednesday.